Question 1. Why is it necessary to measure the RF power between the matching network and the plasma discharge? the matching network topology [Howling92, Salem98]. The only accurate and fast way to measure the delivered power is to use an in-situ RF diagnostic compatible with the high reflected power (>90%) between the plasma chamber and the matching network. We have developed this solution by combining many proprietary innovations into the Vigilant Power Monitor to offer the most advanced RF power diagnostic for plasma applications. Here is some experimental data measured with Vigilant Power Monitor between a matching network and an ICP discharge. The probe was connected in series with the input of the planar ICP coil excited at 13.56MHz. The experimental setup is described here. This presented data is courtesy of Andrew Gibson & Jean-Paul Booth from LPP at Ecole Polytechnique (France). The dissipated power measured at the input of the coil (Pinput) is equal to the sum of the discharge power (Pdischarge) and resistive losses (Pohm) in the coil. Pinput and the RF coil current (Icoil) were measured with the probe as a function of the power delivered by the generator (Pgenerator). The resistive losses were calculated with the formula: Pohm = (1/2) x Rcoil x (Icoil)². Rcoil is the coil resistance without plasma. 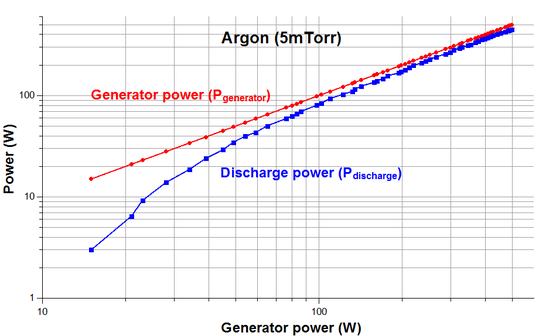 The dissipated power in the discharge can therefore be calculated (Pdischarge=Pinput-Pohm) and plotted as a function of the generator power for a pure argon discharge at 5mTorr. 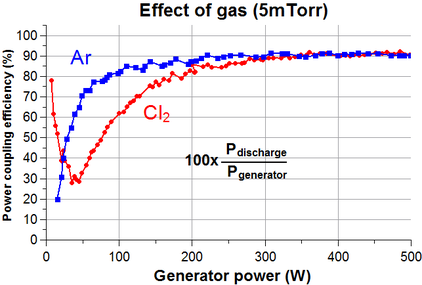 The fraction of the generator power dissipated into the discharge (in %) is also plotted below for two different gases at 5mTorr: argon and chlorine. The power delivered by the RF generator is not a reliable approximation of the discharge power (especially at low and mid power). The fraction of the generator power dissipated into the discharge is not constant and varies in a non-trivial way with the RF power and the gas chemistry. These results are consistent with the work cited in the above review.